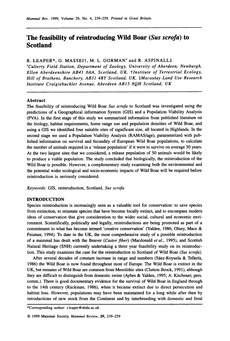 The feasibility of reintroducing Wild Boar Sus scrofa to Scotland was investigated using the predictions of a Geographical information System (GIS) and a Population Viability Analysis (PVA). In the first stage of this study we summarized information from published literature on the biology, habitat requirements, home range use and population densities of Wild Boar, and using a GIS we identified four suitable sites of significant size, all located in Highlands. In the second stage we used a Population Viability Analysis (RAMAS/age), parameterized with published information on survival and fecundity of European Wild Boar populations, to calculate the number of animals required in a ‘release population’ if it were to survive on average 50 years. At the two largest sites that we considered, a release population of 50 animals would be likely to produce a viable population. The study concluded that biologically, the reintroduction of the Wild Boar is possible. However, a complementary study examining both the environmental and the potential wider ecological and socio-economic impacts of Wild Boar will be required before reintroduction is seriously considered.